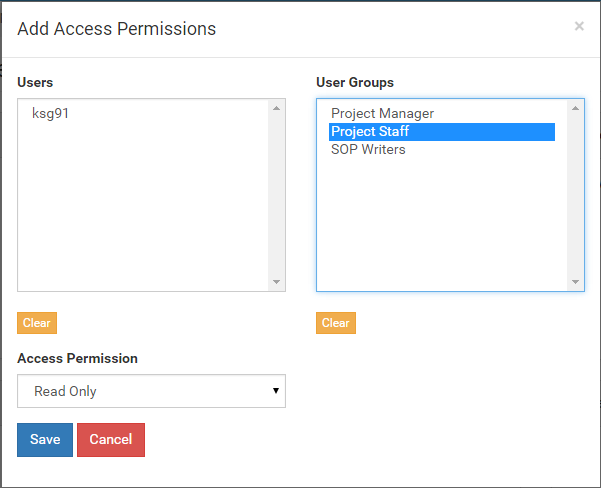 After we’ve created the document groups, we need to assign permissions and properties to them so our users can access them. Properties that are applied to a document group will be inherited by any sub document groups and documents. To override inherited permissions, apply the permission directly to the document group or document. Select the document group, My Starting Project, from the Hierarchy at left. 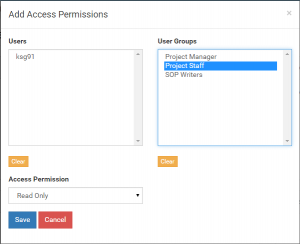 Add the access permission Read Only Accessto the Project Staff user group. This allows everyone we assigned to the user group beforehand the permission to view the document group and its sub document groups or documents. Add the access permission Read + Write Accessto the user group SOP Writers. In addition to viewing the document group and its documents, this will allow users in that group to upload new documents and modify them. Add the user group Project Manager as an approver. The users we assigned to this group will be notified of any approval request for documents added or modified by the SOP Writers. They must review and approve these files in order for them to become accessible to the document group. Next we will add a deadline to the document group, click on “gear” sign ‘Deadline’ tag under Settings heading. Enter ‘14’ into the text field to add a 2 week deadline to the document group. The system will email approvers to remind them to complete their approvals before the deadline. If we want to schedule a bi-annual review for documents in the project, we can assign an approval interval. Documents with an approval interval will expire if they are not reapproved by a document approver before the approval cycle passes. Now we are set up and ready to go. If you have activated the Staff, Writer, and Approver accounts, you can log into them and see the differences in the user interface. The Staff account does not have access to upload documents or enter the admin menu. The Writer and Approver accounts can upload documents but cannot access the admin menu.